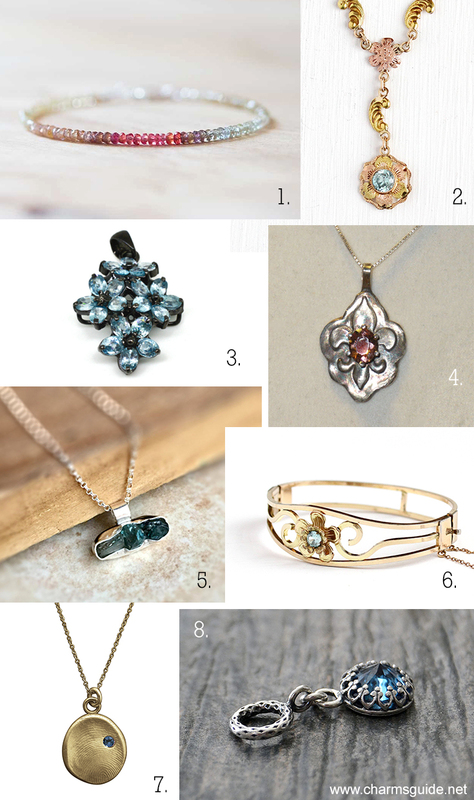 Facts, folklore, healing properties for this December birthstone, plus our curated selection of zircon jewelry. Zircon is the oldest known mineral on earth, and there are samples that are over 4 billion years old. The word Zircon derives from the Arabic and means gold and color, and Zircon (not to be confused with cubic zirconia) does come in a variety of colors in the brown, orange and red family, but also in green, yellow, colorless and blue. The clear variety has long been used as a diamond imitation, but today, the most popular hue is blue. Zircon can be found in many places around the world, although most are mined in Cambodia, Thailand and Vietnam, and it is a relatively inexpensive, and very popular, gemstone. Zircon is an important stone in Ayurvedic medicine, where it is thought to bring wisdom, a noble heart, good luck, joy and wealth. It it also thought to relieve pain, help with sleep problems, and protects the muscles, bones, nerves and organs. 1. Delicate bracelet with natural faceted zircon rondelles in shades of yellow, cream, blue-grey and violet-brown, with a center segment of vivid red sapphires. Zircon bracelet handmade by Kelly of Moon Lab Jewelry. 2. Vintage 10k rose and yellow gold necklace with a flower pendant set with a faceted blue zircon gemstone. 1930s Art Deco necklace from Maejean Vintage. 3. Vintage sterling silver pendant set with 20 oval cut blue zircons from Ann Arbor Antiques. 4. Fleur de Lis silver pendant set with a red-orange zircon gemstone. Handmade pendant necklace by Barking Rock. 5. Sterling silver charm necklace set with a rough blue-grey zircon gemstone. Handmade December birthstone necklace by Lizix26. 6. Vintage gold filled bangle bracelet with a flower centerpiece set with a faceted blue zircon. 1940s bracelet from Maejean Vintage. 7. This one would also make a fabulous Mother’s Day gift! 14kt solid yellow, white or rose gold custom fingerprint pendant set with a blue zircon. December birthstone pendant handmade by Joanne Hart of Luxe Design Jewellery. 8. Sterling silver slide charm for European style bracelets (like Pandora) set with a blue zircon. Birthstone dangle charm by The Wrapped Pixie.